I am reviewing the Pure One Flow portable Internet radio which is the younger brother of the Pure Evoke Flow radio that I have reviewed a while ago. This unit is designed along the same lines as the “old-style” portable radio that can be perched on a window sill or the top of a fridge. 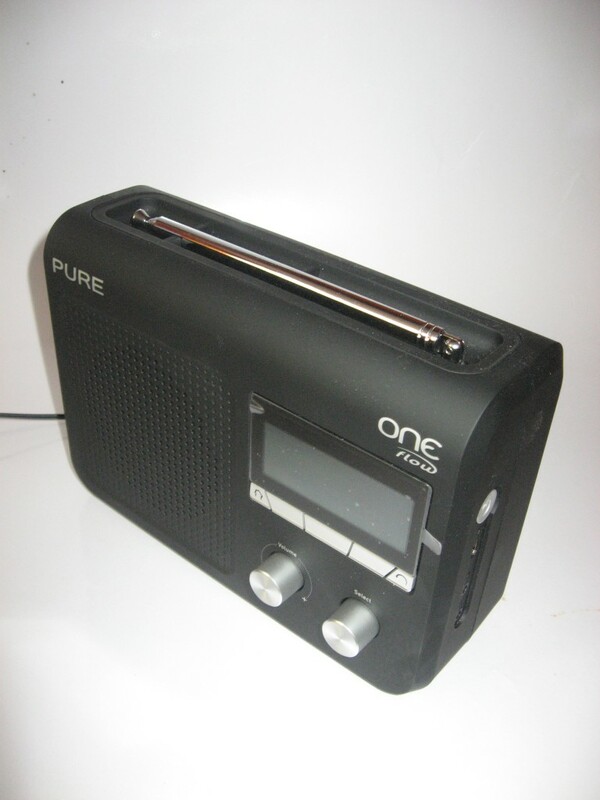 The Pure One Flow is the same size as a midsized portable radio and is housed in a rubberised cabinet with knobs for volume and “select” function and buttons below LCD display. The rubberised casing is a marked difference from the glossy plastic that is used on some radios, which attracts fingerprints and is hard to keep clean. I also like the knobs, especially for the sound volume because it is an interface most of us are accustomed to, where you can just “flick” the knob downwards to turn it down. Like the Evoke Flow radio that I previously reviewed, this unit can work on AC using a supplied “wall-wart” power adaptor or battery power using a “ChargePAK” rechargeable battery pack that is available as an extra-cost option. Audio connectivity is in the form of an auxiliary-in jack so you can use the radio as an amplified speaker for your MP3 player or other audio device. It also has a headphone jack which is a connection that I am noticing is becoming increasingly rare for Internet radios. The reason I find this connection important is that you could use an active-speaker system like a pair of computer speakers as better-sounding more-powerful speakers for the radio. 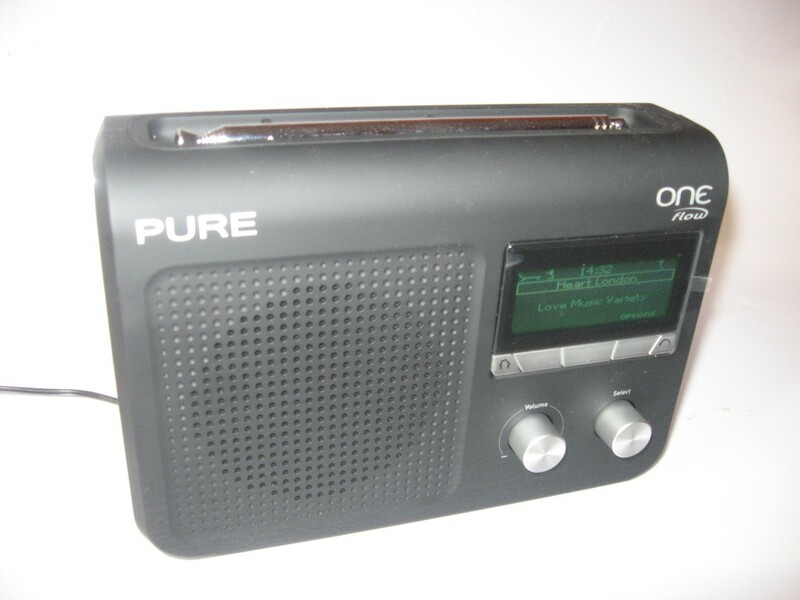 The set works well as a DAB-based digital radio, being able to pick up all of the multiplexes that are broadcast in our area. For Internet-radio station selection, this unit uses a “Form style” user interface if you intend to select a smaller group of stations but will give you the complete list of stations if you are just browsing. This is in contrast to the “tree-based” approach that most Internet radios use for selecting stations. There is also access to a “sounds” service where you can hear sounds like sea wave; as well as access to the “FlowSongs” music download service. This radio works properly as a DLNA-compliant media player, being able to play most audio file types that are held on UPnP AV media servers. The sound quality for this set is very similar to an average mid-sized portable radio such as the archetypal transistor radio of the 1960s. It can still fill an average-sized room with music and the sound is focused around the middle frequencies. This unit could be improved with the telescopic aerial being used for the Wi-Fi wireless network as well as for FM and DAB radio. The Wi-Fi functionality could work well with keeping the details for up to five wireless networks, which can be useful if you take the radio between multiple locations, which is something you would be tempted to do more readily with this set. Another limitation is that you can’t enable daylight-saving time on this set. Instead, when you determine the time zone, you only can set up for standard time. This could be rectified with a firmware update which exposes a “daylight-saving” on-off function or access to a table of “spring-forward / fall-back” times hosted on the manufacturer’s Website. Another improvement that I would like to see would be to support regular AA, C or D batteries even with a battery cage so you don’t have to look for the hard-to-get ChargePAK battery packs. This set may be considered as an option when you want to replace that old “transistor radio” with something that gives you access to “modern” radio sources like DAB or Internet radio. It could he very useful where you want a set of this class to be highly rugged and durable. How is the Internet affecting Pay TV?